Please visit our new ezPak wet panel carriers. "My favorite studio has perfect light, countless subjects and endless space. It is the great outdoors." - Kevin Macpherson "Landscape painting Inside & Out". 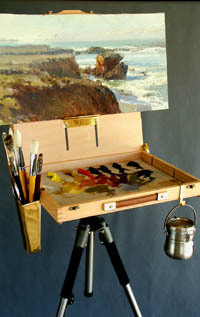 Artwork Essentials brings you superior plein air easels. 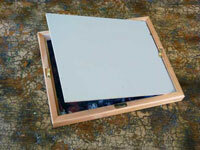 field easels, wet panel carriers and other art supplies. Browse our online store with the navigation above for products and ordering information. The EASyL sets a new standard for plein-air painting equipment. Beautifully manufactured in wood and brass, EASyL can be completely set up and ready to use in under 2 minutes. Using a professional tripod, the EASyL is sturdy and well suited to rugged terrain. Artwork Essentials, Inc. is the designer, manufacturer, and the online shop providing the full range of EASyL plein air painting products. Note the tripod in the video has been upgraded to a newer model.